But any true dork knows that somewhere between the front and back cover are usually 5 or 6 pages dedicated to the dorks among us. There’s always a section that sells movie-accurate prop replicas from whatever action/adventure/fantasy franchise is hot at the moment. Geeks can thrill at owning a Green Lantern ring exactly like the one that Ryan Reynolds wore in the movie. Want an authentic Christopher Nolan-era, sterling silver battarang? No problem. For $35.95 they’ve got that. Were you absolutely spellbound by the tiara that Kate Blanchett wore as Galadriel in “The Lord of the Rings”? You can have that too. I’ve never actually ordered anything from Skymall, but I always enjoy looking to see what’s new since the last time I was on a plane. As it turns out, those movie-accurate prop replicas in Skymall are the product of one independent company called The Noble Collection, and naturally they have their own website. That’s right. Now dorks the world over can shop Skymall-style without cramming into a crowded 747. How does that relate to raising well-adjusted children in the tradition of all-things dork, you ask? It applies on two fronts. 1) We recently finished reading the first Harry Potter book, and at long last the kids got to watch the Bluray extended edition for movie night. Ever since, Episode V has been trying to use “wingardium leviosa” to levitate his dinner off of his plate and into his mouth. Needless to say it hasn’t worked for him yet. 2) “The Hobbit” and “The Lord of the Rings” have always loomed large around our house. Though my kids haven’t seen Peter Jackson’s trilogy (they’re way too young – and they have to read the books first), they have seen the Rankin/Bass animated version of “The Hobbit” enough times to know it by heart. They are also well aware of the fact that the “grownup” version of the movie is coming out in a couple weeks. Combine that with the fact that DorkDaddy usually buys Episode IV an age-appropriate piece of jewelry for Xmas every year and you can connect the dots. The One Ring… but it’ll cost you. This year for Xmas, thanks in large part to The Noble Collection, under the tree my children will find two special little gifts – one to Episode V from Olivander (he’s the guy in the Harry Potter universe who gives all the wizards and witches their wands) and one to Episode IV from Smeagol (Smeagol/Gollum held on to The One Ring for 500 years before it came to Bilbo Baggins). Sadly Episode IV’s movie-accurate ring doesn’t turn you invisible when you put it on. Just as well though. But wave Episode V’s wand and the tip lights up (LUMOS!). Wave it again and it goes out. Sweet! For those of you who go window shopping at The Noble Collection’s website after reading this blog, please note this disclaimer: I most definitely did *NOT* buy my daughter a $595.95 10K solid gold deluxe edition ring that she will likely lose on the playground within a week of returning to school. The gift to her from Smeagol will have in it a ring and chain in a velvet pouch that came with the deluxe edition of a Lord of the Rings video game I bought almost 6 years ago (bought it for the soundtrack… not for the chintzy ring and chain). The pouch has been sitting on my desk at work just waiting to be discovered by the right little Hobbit. It’s time has come. The ring wants to be found. 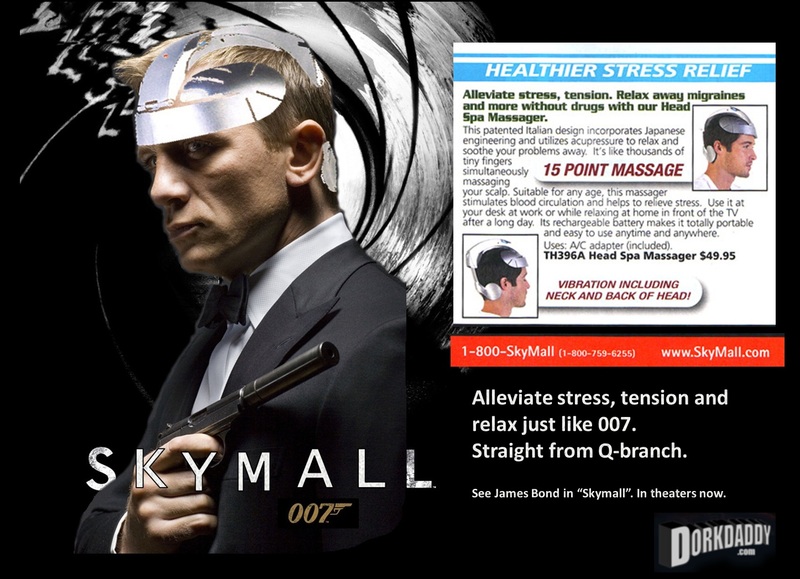 My wife said she’d take the massager if it came with Daniel Craig too. I already have a Green Lantern ring (not Ryan Reynolds, Hal Jordan’s) but my 7 year old daughter wants Star Wars figures for Christmas (which brought a huge smile to my face and a warmth to my heart). Looks like I’m headed to their website. “not Ryan Reynolds, Hal Jordan’s” — amen.